Nancy Ruth Stratton-Geyer of Auburn, AL passed away peacefully on April 6, 2018. Nancy was born June 21, 1933. She was the daughter of Col. C.W. Stratton and Ruth Stratton. She is survived by her brother and sister-in-law The Hon. and Mrs. C.W. Stratton of Lawton, Oklahoma. They lived the life of a military family moving from place to place. They eventually called Lawton, Oklahoma home base. Nancy was the loving wife of Roger Dean Geyer. They were married on October 3, 1954. Roger preceded her in death and was waiting with open arms as she crossed over. They were the loving parents of five children: Stefan (Kim), Gretchen, Heidi (Kevin), Heather (Mike), and Charles (Ashley), and loving grandparents to twelve grandchildren: Branden (Erin), Brianne, Brenna, Teague, Anna, Cairli, Alecia, Alex, Andrew, Kyle, Mara, and Michael. Nancy was a teacher. She had a passion for children. 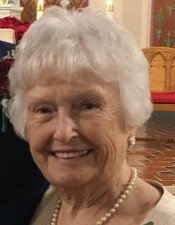 She taught school for forty five years and continued teaching Sunday School. Her last class was April 1, 2018. Nancy was an avid sports fan. She enjoyed nothing more than cheering on her children and grandchildren as they competed in various sporting events. Nancy was lovingly known as Soccer Grandma to the Auburn Community. Above all Nancy loved our Lord Jesus Christ. She believed in everlasting life. A memorial service will be held at Auburn United Methodist Church on Saturday, April 14, 2018 at 2:00p.m. A reception will follow the memorial service. In lieu of flowers donations can be made to Auburn United Methodist Church Sunday School Program. The Nancy Geyer Memorial Fund.